The variety and quality of East Coast brews is one of the delicious surprises of our trip. I’ve come to realize that prior to setting out, I was a New York City beer bigot. It wasn’t that I thought New York City had a lock on great craft brewers, they don’t. It’s that they have great bars with beer lists a mile long. It comforted me knowing that I could walk into the Peculier Pub and indulge in any of their more than 300 beers. I assumed, wrongly, that once I left the great metropolis I’d have to settle for less. Maybe my bigotry isn’t so much about place, as it is about time. It wasn’t that long ago that a typical bar would advertise “8 Beers on Tap” and serve up Bud, Bud Lite, Miller, Miller Lite, Coors, Coors Lite, Michelob, and Michelob Lite. Those aren’t bad beers, they’re the same beer. It’s like Henry Ford telling his customer they can have any color car they want, as long as it’s black. The American Pilsner had become the Model T of our age. But something changed while I wasn’t paying attention. The great beers that I thought could only be found in storied New York City pubs have migrated to the rest of the country. Now it’s not uncommon for bars to advertise that they don’t pour any of those most popular beers. 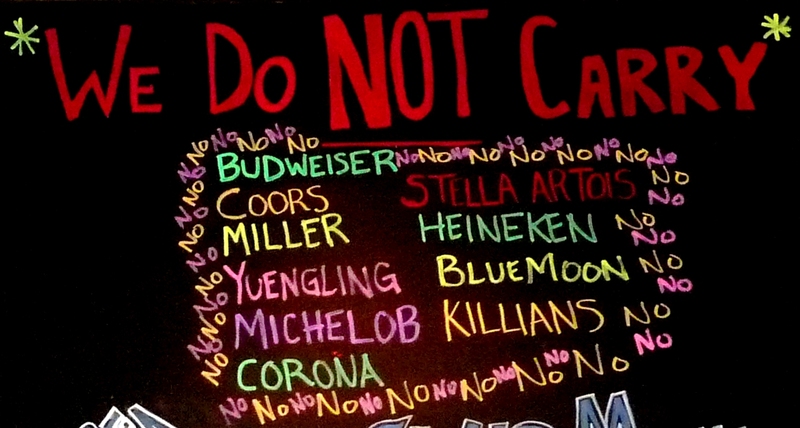 ‘No Crap on Tap’ has become a popular refrain. Better still, craft brewers are popping up everywhere and making fantastic regional beers that you can’t get anywhere else, even in New York. Who knew I’d have to leave the city to find awesome beer? 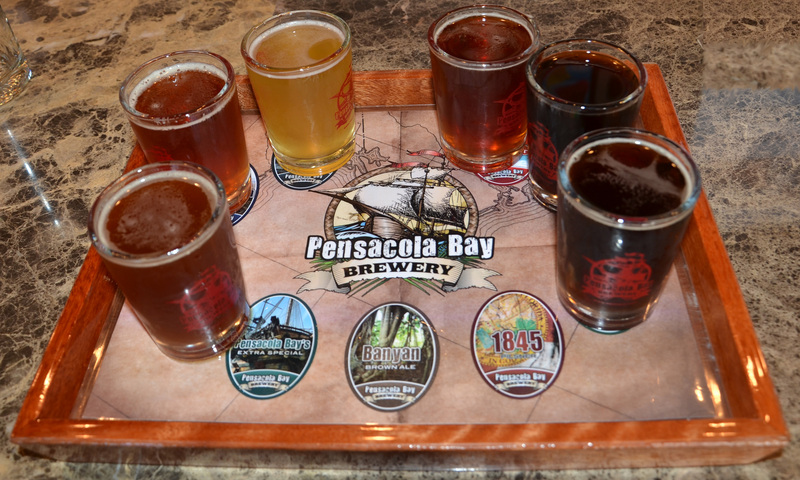 Pensacola Bay Brewery is one such place. They only opened their doors in October 2010 and already have an award winning line-up. We tasted their entire beer list, and were stunned at the quality from start to finish. From a surprisingly light and flavorful ESB, through a malt-toffee Brown Ale, and arriving at a perfectly hoppy IPA the flight was a master class in beer varietals. For a brewer who only opened their doors in the last several months, no learning curve was evident. Normally such a young brewery would have a line-up of mostly work-in-progress beers supported by one or two standouts. Not at Pensacola Bay. Everything was excellent. Our only regret is that we missed three new beers they’re adding that are not yet available. I may make a special trip back to get a growler of their Dopple Bock once they start pouring it. I won’t even need to taste it first if the rest of their offerings are any indication. Mark Twain commented that “Travel is the fatal to prejudice, bigotry, and narrow mindedness.” I admit that before our trip I assumed the rest of the continent was awash in ‘light and refreshingly’ boring pilsners. As usual, Mark Twain was right. And, in this instance, I’m incredibly happy to be proven wrong. Not sure craft brewing “migrated” out of NYC. It’s been here all along. Out here in the west, you can’t swing a dead cat without hitting a brew pub with some fantastic offerings. Plus all the interest in real beer means you can walk into any Chili’s or Applebee’s and get a quality beer on tap. Glad you’re discovering all the rest of the country has to offer. It’s a tough job, but somebody has to do it, right? I certainly didn’t mean to imply that craft brewing migrated out of NYC. If anything, craft brews migrated from the west to the east. But long before the small batch sensation started to catch on in the mid-90s, places like the Peculier Pub were serving up great European brews. That stuff was basically impossible to find outside of major cities. It is a fairly recent phenomenon that craft brews, and their European predecessors, have gone mainstream. Living in the city for the last 20 years I was mostly insulated from what was happening elsewhere. I always had access to good beer and I didn’t recognize the growing supply of good domestic brews as reflecting a change in the domestic pallet more generally. It wasn’t until I started exploring the country that I realized how much quality beers have proliferated. Little did I know that Wal-Mart store shelves in Theodore, Alabama would be stocked with it too. Just messin’ with ya;) I knew what you meant. Either way, its a great trend away from mass produced, bland products made to suit the lowest common denominator. My only complaint is I’ll never be able to try them all.